•Jain SLEE :- JAIN is a Sun Java standards initiative and part of the Java Community Process. •For telephony, data and wireless communications networks, the Java APIs defined through. •A Service Logic Execution Environment (SLEE) is high-throughput, low-latency, event-processing application environment. 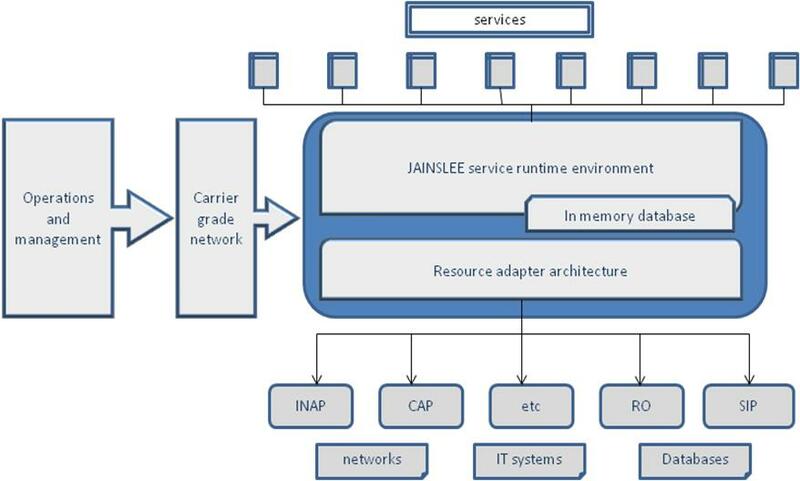 •JAIN SLEE is designed specifically to allow implementations of a standard to meet the stringent requirements of communications applications (such as network-signaling applications). – Portable services and network independence. – Hosting on an extensible platform. – services and SLEE platform available from many vendors. •Industry standard :- JSLEE is the industry-agreed standard for an application server that meets the specific needs of telecommunications networks. •Network independence:-The JSLEE programming model enables network independence for the application developer. The model is independent of any particular network protocol, API or network topology. •Converged services:- JSLEE provides the means to create genuinely converged services, which can run across multiple network technologies. •Network migrations :-As JSLEE provides a generic, horizontal platform across many protocols, independent of the network technology, it provides the ideal enabler technology for smooth transition between networks. interfaces to communication protocol stacks, directory services or external systems. in this area, Java for Management Extensions (JMX).